Springtime Apricot Cake was the dessert recipe for the recent Easter Family Brunch class at Grace-Marie’s Kitchen at Bristol Farms in Manhattan Beach. This wonderful cake was the ending to a delicious luncheon which also included Easter Banana Muffins, Roasted Shrimp & Pineapple Salad, and “Croque-Madame” Brunch Gratin. Grace-Marie has always made such good desserts and this one takes the cake, so to speak. This class was also the surprise gift presentation to Grace-Marie from her students to celebrate her 20 years at the helm of Grace-Marie’s Kitchen. You can see the photos on the Shrimp & Pineapple Salad post. They will make you smile and get teary-eyed. 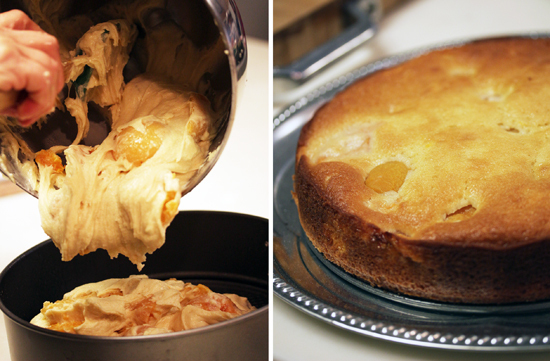 This is the first cake I have seen that has whole canned apricots in it. Usually they’re sliced or diced. Leave it to Grace-Marie to do the full monty. 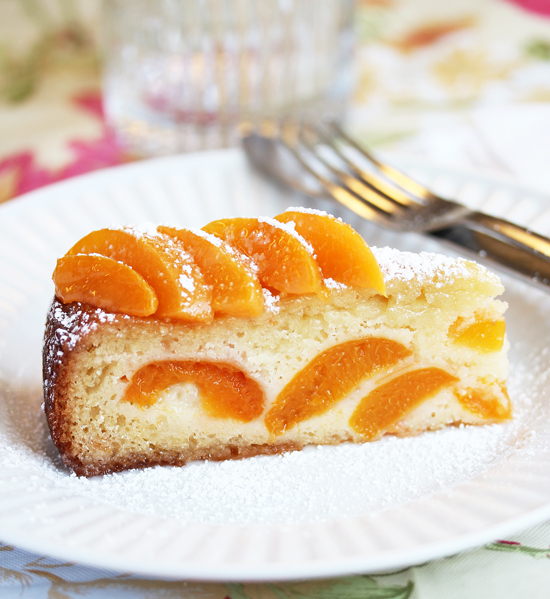 This recipe has a nice glaze made from the apricot juice from the fruit, and powdered sugar. It’s really pretty the way it runs down the sides. Grace-Marie cut this cake into 16 portions, which would be enough for a barbeque with friends, or the end of a fancy dinner. 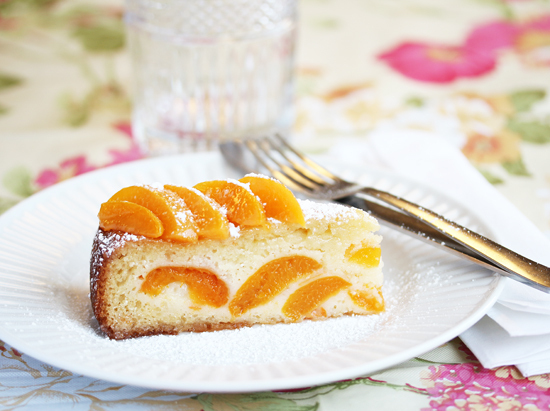 It could be topped with whipped cream and more of the diced apricots. Or ice cream. Get creative…. For additional recipes from Grace-Marie’s Kitchen, look under Categories in the right-hand column. For more information about the new schedule of cooking classes, visit Grace-Marie online at Bristol Farms or email her at gmj@bristolfarms.com. 1. Preheat oven to 350 degrees F. Coat 10” spring form pan with cooking spray. Place on baking sheet pan lined with parchment. 2. Combine and whisk together flour, baking powder, nutmeg and salt. 3. Place butter and sugar into electric mixer bowl with paddle and beat until fluffy and very creamy. Add eggs and almond extract. Beat again until well mixed. 4. On low speed slowly add flour mixture alternately with cream, just until blended well. 5. By hand, fold in drained apricots. Transfer batter into prepared pan, spreading it out evenly. 6. Bake until risen, golden brown and wooden skewer comes cleanly out of center of cake, about 45 minutes. 7. Cool for 10 minutes in pan, then run knife around inner edge and remove outer ring of spring form pan. Cool completely. 1. Platter the cake, keeping it on bottom of pan or not. Whisk together powdered sugar, juice and extract until blended well. Drizzle over cake, allowing it to run down sides. Cut into portions and serve. Note: Optional, sift powdered sugar over top of cake pieces before serving. Wow, it looks so fancy, you could’ve lied about the can and no one would’ve known. Well, except for Grace Marie. Top photo is to die for. Do you think you could use fresh apricots and maybe cook them first? The apricots at the farmer’s market right now are delicious. I follow many food blogs, but yours is one of the few I actually cook/bake from. Made this today (in 9″ springform – baked 50 minutes, could have used a few more minutes)- but it is so, so good! (See the missing piece – that was mine!). 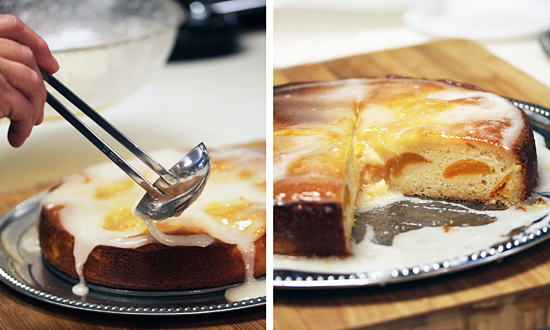 Thanks for sharing Grace-Marie’s recipe and your beautiful photos of it.